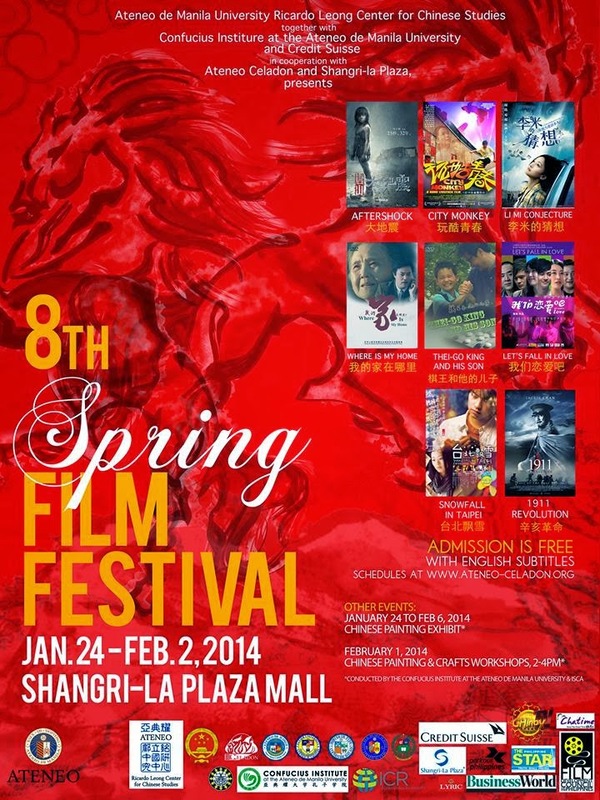 The Ateneo de Manila University Ricardo Leong Center for Chinese Studies and the Ateneo Celadon present the 8th Spring Film Festival to be held on January 24 to February 2, 2014 at Shang Cineplex, Shangri-La Mall in Mandaluyong City. Admission is FREE. The Spring Festival is one of the most celebrated festivals in the Chinese-Filipino community. The organizers have brought the joys and artistry of the culture of Chinese films to the Philippines through the annual Spring Film Festival. Over the years, they have extended our reach and have held the festival simultaneously in Metro Manila, Cebu and Davao, with the recent addition of Iloilo and Cagayan de Oro to our list of festival destinations just last year. On the 8th Spring Film Festival we will further expand our audience to Naga, Dagupan, and Baguio showing 8 Chinese films. Please find the complete schedules at the bottom. Tangshan, 1976. Two seven-year-old twin children are buried under the rubble of the devastating earthquake. The rescue team explains to their mother, Li Yuanni that freeing either child will almost certainly result in the death of the other. She is forced to make the most difficult decision of her life and must choose between her children. Li Yuanni has no idea that her decision is overheard by her daughter Fang Deng, the female twin. Although she has been left behind as dead, the little girl miraculously survives for several more days before being pulled clear by another rescue team who believe that she is simply a corpse. She wakes up in the pouring rain next to the dead body of her father. Suffering from the emotional shocks of the disaster and the painful memory of her mother's choice, Fang Deng refuses to reveal her identity. She is adopted by a middle-aged Chinese couple and years later moves to Canada to marry. Shadowed by the traumatic experiences of the earthquake and devastated by her mother's decision to abandon her, she continues to be emotionally withdrawn throughout her adult years. Trailer: "Let's Fall in Love"
Due to the intervention of her parents, taxi driver girl Li Mi had to break up with her long-term boyfriend, Fang Wen, who had disappeared from her life yet seemed to remain connected. For four years, Li Mi had continued to search for his whereabouts in a constant tug-of-war between hope and despair. An eerie murder was witnessed, leading her to a man nearly identical to her missing lover. Could he be the one she has been looking for? Her life suddenly changes. Then come terrible yet pitiful drug dealers, and irascible but highly duteous police detectives…Behind the cascades of mysteries, compromises lie still between those who were once in love.